The all new SoftTouch flooring is not just kids flooring; the softer, more slip-resistant texture is overwhelmingly preferred by parents over the traditional cross-cut foam tile. All of our SoftFloor products are also a big hit with environmentally the conscious for being recyclable, sustainable, environmentally friendly and made with recycled materials. Each 2'x2'x1/2" tile comes with 2 border pieces and is sold in cartons of 9 (36 sq. ft.) or 16 (64 sq. ft.). To make a 10'x10' (100 sq. ft.) area, use a carton of 9 and a carton of 16 tiles. Yellow and Red are both only available in the Yellow / Red / Royal Blue / Green set packs (16 tiles, 4 of each color). 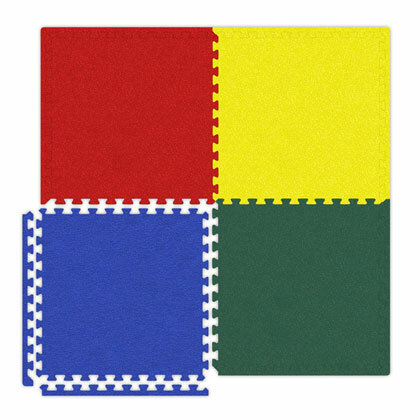 Brown, Gray, Black, Royal Blue and Green are all available for individual color sales in boxes of 9 or 16 tiles.